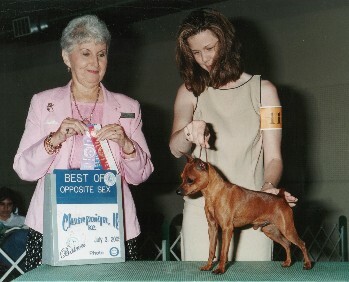 Nikey pictured with one of his favorite Judges, Ann Hearn. Thank you Sussie for letting this sweet boy into our home. He keeps us in stitches! Standing at 11 1/8 inches. Nikey is a very dark rich vibrant red, his color is just stunning. but he is just dark!!! Darker even than it shows in his pictures. and very pretty hackney like action. We really think this boy will do very well in and out of the ring. He sure has the look and personality to pull it off! UKC CH Sorita's Verbal Warning " Champion Class"